Light grill if you plan to grill the burgers. Mix lettuce, onions, and tomatoes in a large bowl. Mix steak seasoning and Worcestershire sauce into the ground beef and pat out thin burgers. Grill or pan fry burgers to desired doneness and top with cheese. 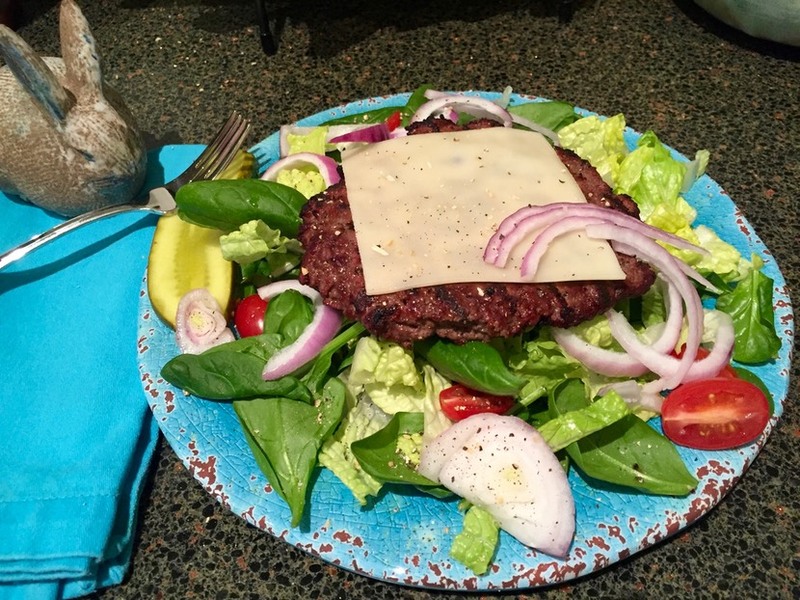 Fill dinner plates with lettuce mixture, add dressing of choice, and top with a burger. Add a little more onion on top, maybe a pickle, and any optional topping. Optional toppings include: croutons, avocado, green onions, jalapenos, bacon bits – let your imagination run wild! To a small jar with a lid add 3 Tbsp Balsamic Vinegar, 2 Tbsp olive oil, one minced clove garlic, a tsp of sugar and a pinch of salt. I also added 1 tsp of lemon pepper and ½ tsp of oregano. Shake it up!